The High Trestle Trail is one of my favorite trails to ride. However, weekends usually result in it being too busy for my taste. I took a gamble on gloomy weather keeping most folks away and chose this trail to kick off participating in another 30 Days of Biking. It had been a while since I rode here and I discovered some new features along the trail. Leaving Woodward I noted the new sharing library in the design of a train car. 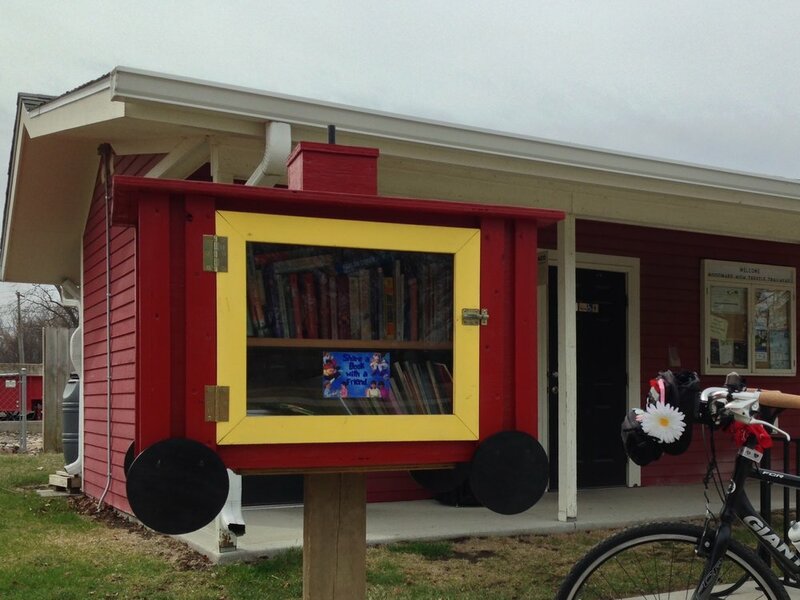 The majority of free libraries I come upon have mostly children's books but this had a good variety. Reaching the bridge I had it all to myself for a while. One of the perks of being out on a gloomy morning. I heard geese, chorus frogs, and even a pheasant. Remembering I had binoculars with me I tried to spot him, but didn't have any luck. Approaching Madrid I couldn't miss seeing the new "on/off ramp" providing an additional way to get from the trail to local businesses. 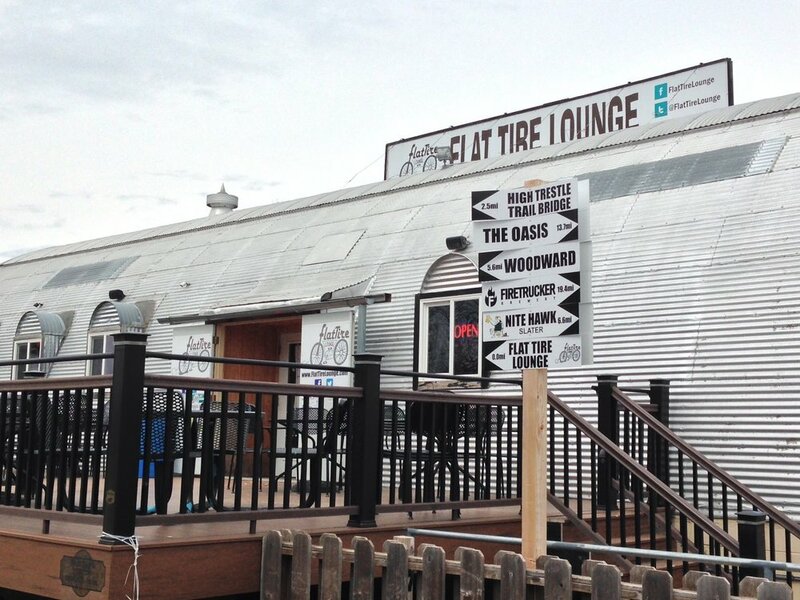 Outside Flat Tire Lounge, I noticed their own sign pointing the direction and mileage to typical trail stops. Greg over at Gravelo has been working on what he's calling a renegade project contributing a bench to the trail. I was excited to find it. Made with former railroad materials It's coming along nicely. It's pretty cool to see people leaving something behind along the trail and it not being trash. The Ballard Bombers were playing the Valley Tigers at the ballfield when I arrived at Earl Grimm Park. I watched the game for a while and ate the sandwich I had brought along. Can't beat a Saturday that includes bike riding, baseball, and new discoveries. Today was not only the first time I've enjoyed coffee* while standing on a 13 story high bridge, it was also my first bike ride brew-up. 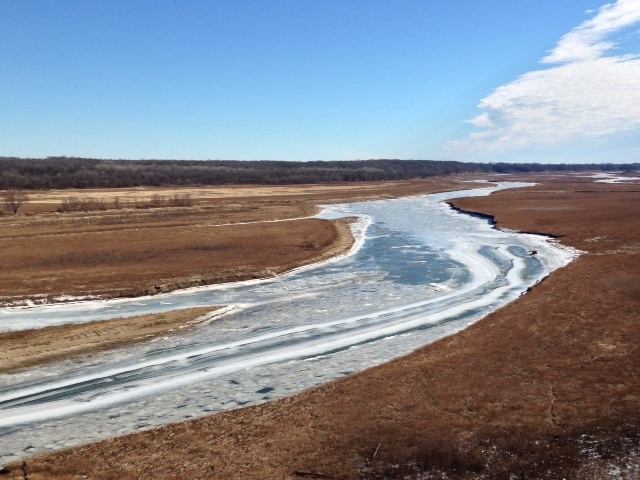 An overlook spot on the High Trestle Bridge proved to be a great location for a coffee break. It was breezy but the stove was nicely tucked out of the wind. In less than 10 minutes I was enjoying my caffeine fix while soaking up some sun and admiring the view. Other than sounds of cracking ice it was a quiet morning. Along with continuing to brainstorm future coffee outside locations, I need to determine a better way to tote coffee gear. I'm sure I looked quite silly riding down the trail using one grocery pannier. Thankfully the only witnesses were deer, and they can't laugh. The High Trestle Trail is 25 miles in length and travels through Woodward, Madrid, Slater, Sheldahl, and Ankeny. The wide concrete trail is in fantastic condition and does not have significant grades or hills. The majority of the trail is flanked by trees. 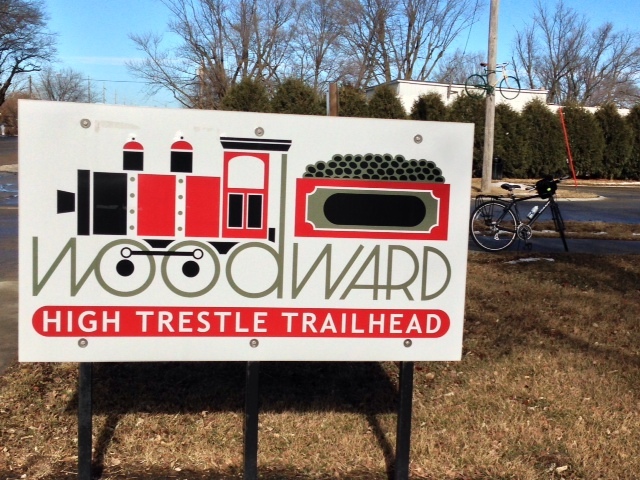 Trailheads with water and restrooms are available in Woodward and Madrid. Parks in Slater and Ankeny can be used as locations for starting a ride. Less than 10 miles from of Ankeny is The Oasis. It’s a trailside rest stop constructed as a memorial to a local cyclist. With it’s shaded picnic area, water fountains, restroom and views of Iowa farmland, it’s a great spot for taking a break along the trail. The highlight of this trail is the bridge. Crossing the Des Moines River it is 13 stories high and a half mile long. The design of the bridge pays tribute to the coal mining industry that one thrived in the area. The spiraling steel frames represent supports used in the coal mines and the designs of the entrance towers depicts veins of coal found in limestone. There are several overlooks on the bridge for enjoying the view of the river valley. Educational signs are posted providing information on the bridge and habitat found in the area. When am I going to stop leaving things behind? It seems like I'm always forgetting to bring something along on my bike rides. Money, bike lock, and sunglasses, seem to be the most frequently forgotten. Today it was my water bottle. Despite having brought it along on the drive to Ankeny, in my haste to hit the trail I left it behind. The weather was cool and windy so I wasn't worried about over-heating. 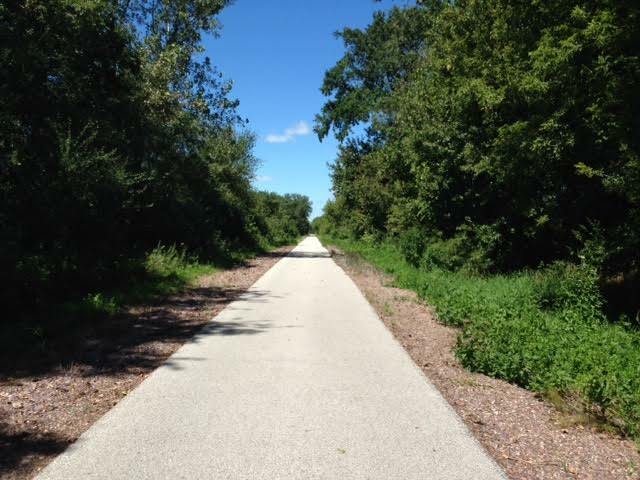 Plus, there's water available along the trail less than 7 miles from Ankeny's trailhead. Turns out I wasn't the only distracted cyclists out on the trail. Pulling over at The Oasis for a drink from the fountain I noticed another forgotten water bottle. This one was sitting on the picnic table. What a coindicence! Someone else forgot their bottle too! I couldn't help but laugh and take comfort knowing my bike wasn't the only one on the trail with an empty bottle cage. The High Trestle Trail is 25 miles in length and travels through Woodward, Madrid, Slater, Sheldahl, and Ankeny. It’s my favorite place to ride thanks to the smooth concrete trail with minimal grades. Wide shoulders and benches along the trail give riders opportunities to take advantage of the beautiful scenery. Trailheads with water and restrooms are available in Woodward and Madrid. Parks in Slater and Ankeny can be used as locations for starting a ride. West of Madrid riders pass under a wooden bridge and two tunnels. One of the tunnels has some can’t-miss art work. The highlight of this trail is the half mile bridge. Crossing the Des Moines River it is a 13 story high work of art. The design of the bridge pays tribute to the coal mining industry that once thrived in the area. The spiraling steel frames represent the supports used in coal mines. Giant towers with designs depicting veins of coal found in limestone greet those about to cross. Bridge overlook areas provide spots for taking in the view of the river valley or reading the education signs posted. At night the bridge is illuminated with LED lights. Thankfully this ride didn't begin with me getting trapped inside the restroom. Read about that embarrassing episode here. I started my bike ride at the Woodward trailhead with plans to ride to Slater. A few days back I had read how the Hotel Patee would be relocating the Frontier Shack to Madrid. Passing through town I found it's new home next to the Flat Tire Lounge. 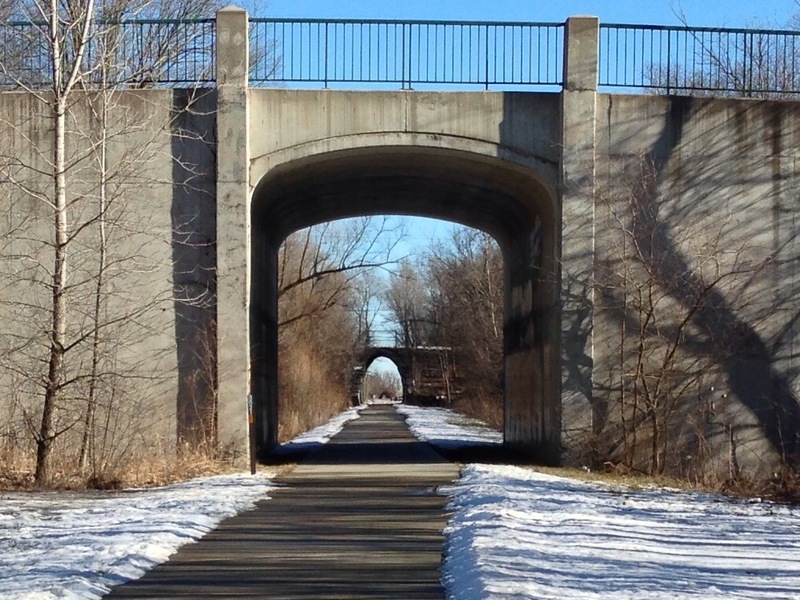 Once it is open for business, this stopping point along the trail is going to be even more popular. I can't wait to take advantage of it. The Iowa winds were blowing...again...helping me reach top speeds on my way to Slater. I was feeling "roadie fast" but dreading the return trip. It was not going to be fun. Reaching Slater I spent some time riding around town. 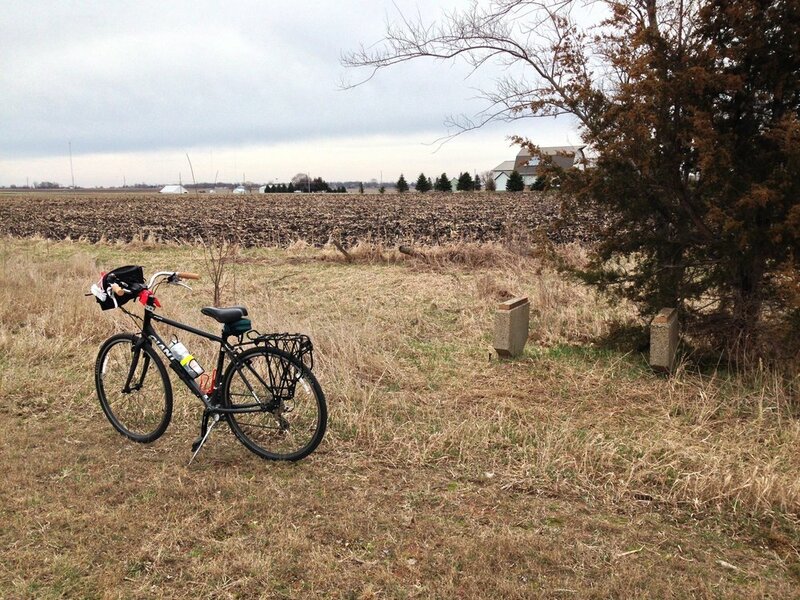 First, I checked out the stretch of the Heart of Iowa Nature Trail on the north side of town. It was in rough shape from folks having walked, biked, and even snowmobiled on it when wet. I had packed myself a pb&j to eat in Slater and stopped by Town & Country Market to grab something to drink. I chose Jenna's Awesome Chocolate Milk from Picket Fence Creamery and then rode over to Earl Grimm Park. I ate my sandwich and enjoyed the awesome chocolate milk while soaking up the sunshine. After delaying the inevitable as long as possible, it was time to face the headwinds and pedal back to Woodward. The ride back wasn't as bad as anticipated but it certainly wasn't much fun. Chugging along I realized headwinds and tailwinds have their dinner time analogies. Headwinds are the veggies and tailwinds are dessert. Headwinds make you stronger and tailwinds are a special treat to be saved for last. Next time I'm "eating my veggies" first. Did I see the pelicans swimming in the waters below or the folks in their canoes? Nope. I missed it. I was always too focused on the nutty notion of falling over the edge. I was missing out on a lot. Views of the Iowa horizon, changing water levels each season brings, and the artistic elements incorporated into the bridge itself. I was being ridiculous! A conjured fear was preventing me from fully enjoying rides on the trail. Time to get over it. While out on a family ride I made a point to stop at one of the bridge’s overlook areas and force myself to look over the railing. I did this each time I rode the trail until I finally felt comfortable. Now pedaling my bike across this 140 feet tall bridge is no big deal. Just the other day I took a leisurely ride from Woodward to Minburn stopping along the bridge to appreciate the view. The frozen river snaked it’s way south and cars the size of a Hot Wheels passed over the highway bridge nearby. A family was spending quality time together on a walk and cyclists were getting in a winter biking fix. No one was afraid. Including me.